When people engage with brands on social media, it’s usually because they are looking to build a relationship or some kind of connection. Don’t miss this opportunity. An engaged social-media audience is priceless for your organization because these connections provide the potential for increased organic growth and recurring donations. Eighty-three percent of Twitter users and 71 percent of Facebook users expect a brand to respond to their posts within 24 hours, and more than 50 percent of Twitter users expect a brand to respond within 2 hours. More users will recommend a brand or organization that gives a quick, yet ineffective response versus a slow, but effective, response. If you don’t know the answer to something, don’t be afraid to say that and tell them you’ll get back to them with the right answer. Use social-media monitoring tools like Google Alerts and Mention to help you keep track of responding to supporters. Responding to your fans’ questions and comments has a chain reaction. Once people see you responding to others, it makes them more likely to engage in a conversation with you, too. Although it may take a little extra time, it’s important to interact with your fans on a personal level as much as you can. Just take a few minutes out of your day to respond to comments and tweet. This will go a long way. One way you can accomplish this is by tagging your supporters when you thank them. This is an easy way to call them out individually and make them feel special. That personalized touch doesn’t always have to be a comment, tweet or a reply. 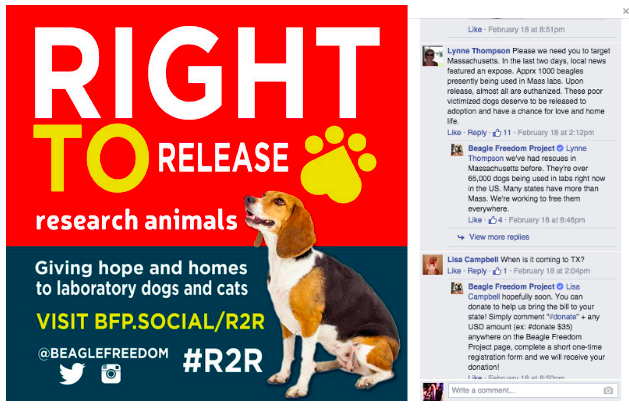 Sometimes, a simple “like” or “share” can mean a lot to someone interacting and supporting your cause. Always remember, your supporters are the gateway to your success, so make sure you’re giving them a pat on the back as well every once in awhile. Personalized thank yous are important and should be used whenever possible. However, it’s not always possible. Make your donors feel special by posting a "thank you" message after a successful fundraising post or sharing news about what’s going on with your organization. 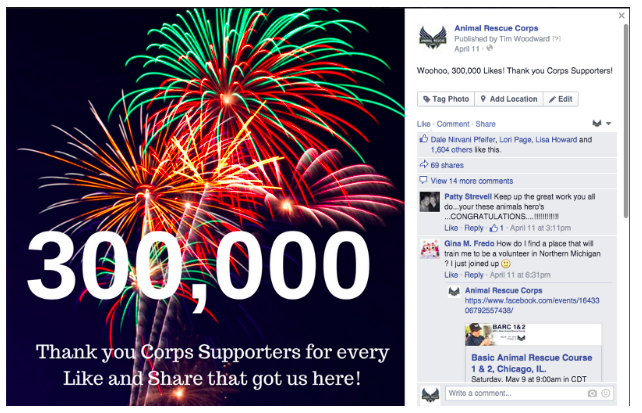 Animal Rescue Corps does a great job honoring their fans and donors. Not only do they remember to thank them after and during campaigns, but they also are incredibly transparent with their audience. Being transparent is an important factor in building a relationship with your fans on social media. Post organizational news and even fundraising goals you’re trying to reach and why, and people will feel more compelled to be a part of your success. 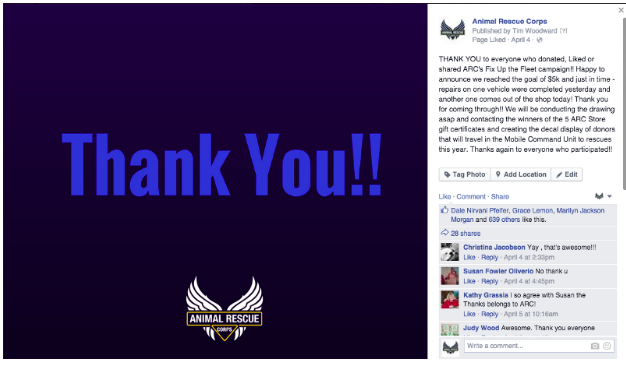 Animal Rescue Corps shares the news, pictures and videos from every rescue operation they complete during and after the mission. This is one of the secrets to their engaged audience. Creating a community around your organization is a great way to differentiate yourself and build a loyal donor base. Plus, a little positive word-of-mouth can go a long way!